Surfers, soul brothers, hippies, and thugs—they’re all part of Victor “Skinny” Delgado’s world growing up in Miami during the turbulent 1960s. Skinny is a pudgy eight-year-old in 1959 when his family arrives in the U.S. fleeing the Castro regime in Cuba. The once-wealthy Delgados move from a mansion with servants in Havana to a roach-infested bungalow in Miami’s low-rent Wynwood district. Over the next ten years the family struggles to survive in this strange, new land—a place where fat men in red suits enter your home through the chimney, demons appear at the door begging for candy, and young women go on dates without chaperones. 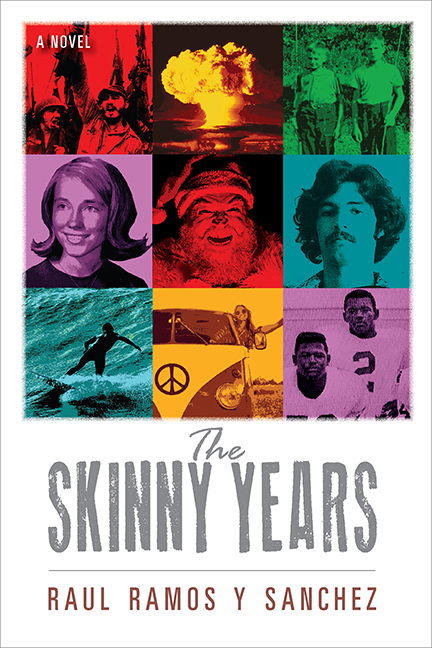 In The Skinny Years: A Cha Cha-to-Acid Rock Coming of Age, there’s only one constant in Skinny’s world as he grows up. From ages 8-18 he longs in vain for the girl of his dreams. She’s his neighbor Janice Bockman, who seems everything American—and everything he’s not. Author Raul Ramos y Sanchez was named Number One among the Top Ten New Latino Authors for 2011 by LatinoStories.com.